I’m sorry I’m a little backwards lately. I’ll explain that in my next post. Apparently, I decided it’d be a good idea to make candy bars a week after Halloween. Eh, you can’t always please everyone. Sometimes, common sense ain’t so common, I guess. I think the best part about these (besides being two ingredients, obv.) would be that they’d make excellent holiday gifts. People love homemade things–it’s a fact (unless they’re weird homemade things, like homemade fruitcake or homemade snuggies or something unacceptably odd and/or gross) and most people won’t mind that you’re recreating candy bars in November and/or December because most people like Kit Kats and most people have the decency not to remind you that this would have been an appropriate recipe for October, but you know…. As I was pondering staging ideas for this recipe (you know I love my staging) I spotted an un-used snap-lid jar in my kitchen and popped them upright. While the jar was a bit too small for these cookies, a correctly-sized jar would be the perfect way to gift these to someone, or tying them up in a cute cellophane bag with ribbon. Yay for 2-ingredient, easy-gift food!! 1. First, prep your work station: Line and attach wax paper onto cookie sheets and adhere with tape; set aside. Open your cracker package and, in stacks of three crackers, cut each cracker stack vertically in thirds, carefully and slowly cutting with a very sharp knife to prevent the crackers from splitting and breaking. (Think the size of a Kit Kat–a thin strip of cracker is perfect). Set aside. 2. Melt your candy bark according to package directions. If you have a large block, cut the block in half for easier melting. I like melting candy bark in glass loaf pans when dipping bars since it’s easier to dip than in a bowl. Once your chocolate is melted (remember, one flavor chocolate per loaf pan, OR work one flavor at a time–much more efficient I think) coat one side of a thin cracker strip with chocolate. Immediately stack with another cracker strip, and dip the second cracker in chocolate. Immediately stack with a third cracker strip, and dip the entire bar in chocolate, ensuring you coat both sides and the ends with melted chocolate. 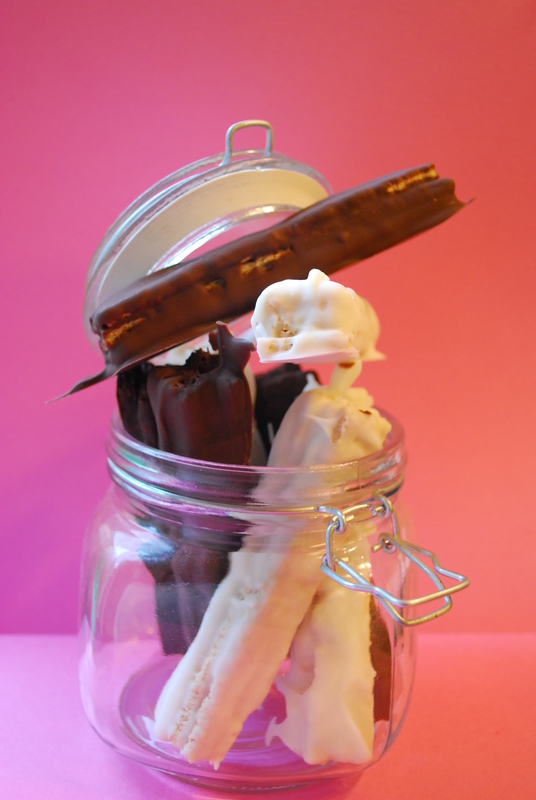 Carefully set your kit kats onto your wax paper-lined cookie sheet to harden while you prepare the remaining kit kats. 3. Once you’ve dipped all your crackers in your melted white chocolate and melted milk chocolate, pop them in the freezer to harden, about 15 minutes. Remove from wax paper and store in an airtight container or plastic baggy, or wrap ’em for instagifts! To make these uber-fancy, drizzle the opposite flavor of chocolate onto chilled bars, e.g., drizzle white chocolate onto milk chocolate bars, or vice versa. You’ll be so fancy! 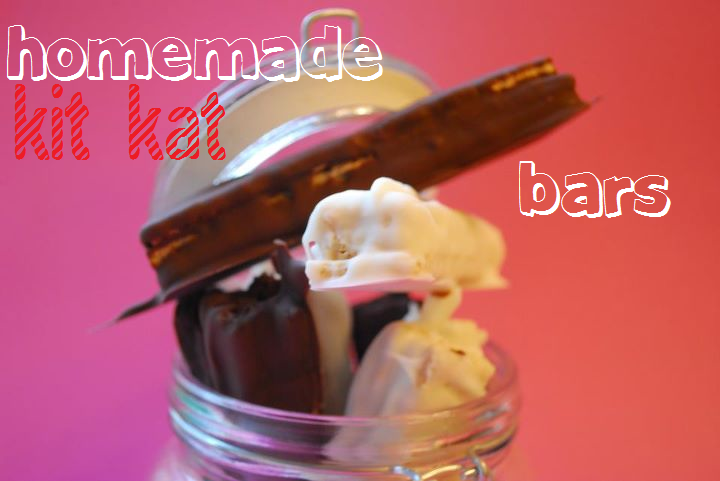 I love recreating candy bars! 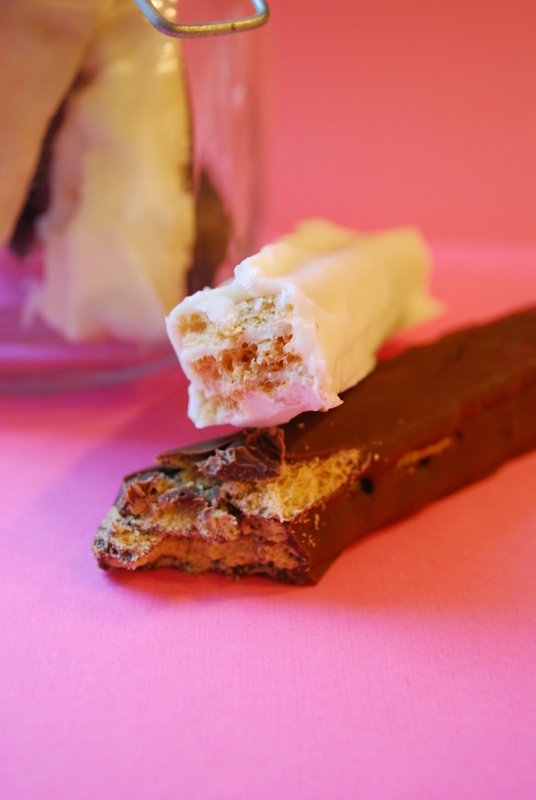 Check out these : almond joys and butterfinger. http://blog.candiquik.com/?p=1536 and http://blog.candiquik.com/?p=989. Hi Sarah! Thanks for stopping by. I definitely have homemade almond joys on my mind–they’re my FAVE. Let me know how you enjoy the kit kats; they’re quite addictive 🙂 xo. I just use those wafers you get with ice cream. They come in chocolate, strawberry, vanilla, orange and lemon flavors. I dip in dark chocolate.